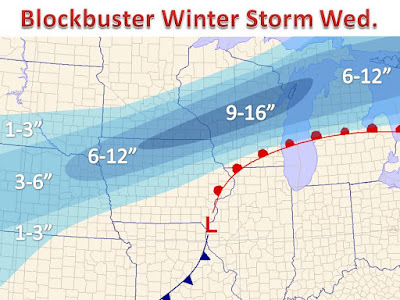 Almost 5 years to the date (Link), another major late March winter storm is poised to strike the Midwest with heavy snow and severe weather to the south. Moderate snow will break out in the northern Plain on Wednesday morning and spread northeast through the day on Wednesday into the early morning hours of Thursday. Computer models continue to bounce around a tad with the exact track of the axis of heaviest snow, but the map on the left is the best bet of where the 6"+ area will set up. Areas closer to the warm front will see some mixing at times of a heavy wet snow, which will limit snow totals as it melts and compacts through the day and even through the overnight on Thursday. Models have been consistent in placing the heaviest band of snow from far SE MN through an area just north of Green Bay, Wisconsin. Confidence is high in this location, but on the outskirts of the band such as Minneapolis a sharp snow to no snow gradient will set up, so more tweaks may be needed in this area, same goes for Madison and SE Wisconsin as the rain to snow line may change 20-30 miles, which would have a profound effect on the total you see on your doorstep. Thanks for stopping by, and feel free to follow on Twitter for continued updates.